Could Valkyrior make the jump to live-action? 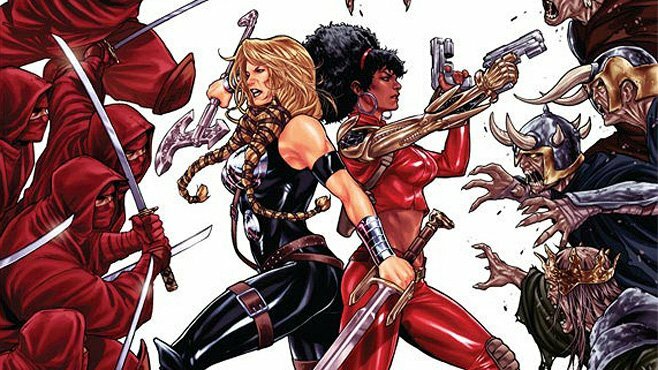 This isn’t the first time that Valkyrie and Misty Knight have been paired together, after Marvel’s Fearless Defenders series launched under the Marvel NOW! initiative four years ago. Alas, the comic series was scrapped in December of 2013, but the team-up clearly left an impression on ardent Marvel fans. But let’s be clear: ever since the Marvel Cinematic Universe began life almost a decade ago, the studio’s TV universe has existed on a separate track. Barring some story elements and the odd Stan Lee cameo, any mention of characters crossing over from the big screen to TV or vice versa tends to dissolve into rumors and hearsay, and recently, Daredevil himself Charlie Cox conceded that the chances of a cross-platform event are slim at best, and non-existent at worst. Simone Missick injected a real sense of tenacity into Misty Knight with the inaugural season of Luke Cage, and fans can look forward to her reprising that role when The Defenders hits Netflix in August. Thompson, meanwhile, is yet to make her Marvel debut, but will do so when Thor: Ragnarok lights up theaters on November 3rd. Regarding a potential Valkyrie/Misty Knight team-up, though, be sure to leave your comments in the usual spot below.